A Report Fee can be added right when you are adding a new appraisal, or from the Appraisal Details page under the Fees & Costs section. Fees can be changed or edited at any time, and new fees can always be added. Start by clicking on the appraisal you wish to edit from your main Dashboard. On the far right, there is a Fees & Costs section. Here, you will want to click on the fee line item you wish to edit. In this case, we are going to edit the line titled “Appraisal Report Fee” (see photo below). 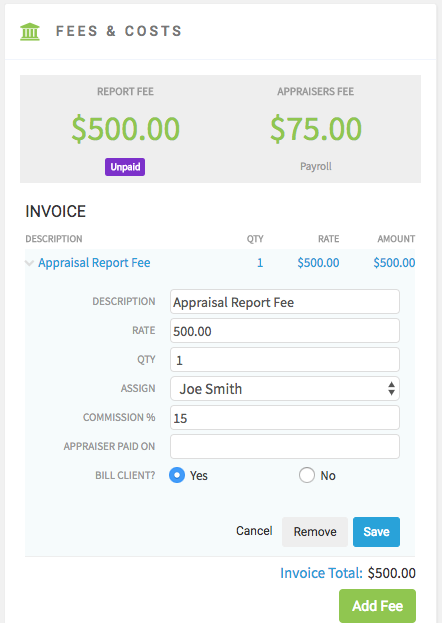 While you’re here, you can edit the fee Description, Rate, Quantity, Assigned Appraiser, Commission % for your Assigned Appraiser, and Paid Date. You can also choose whether or not you wish to bill your client for this specific line item. Be sure to Save any changes when you're finished. You also have the opportunity to remove any fees or payments in the Fees & Costs section by clicking the grey Remove button (see photo below).